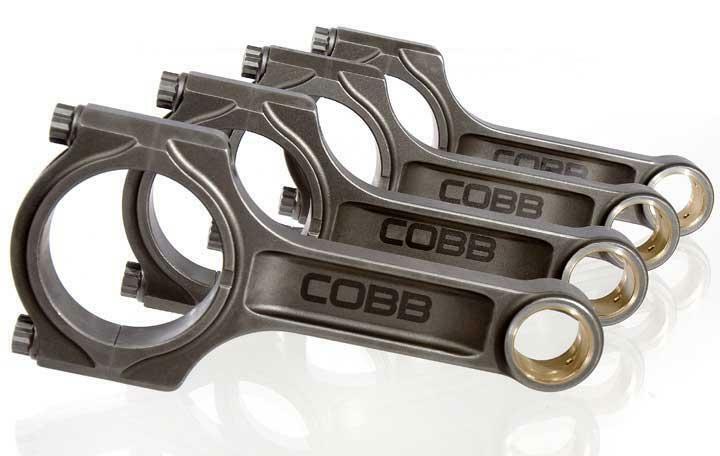 COBB Tuning Connecting Rods SUBARU - Dezod Motorsports Inc - Home of the automotive performance enthusiast since 2002. Precision CNC machined from either Chromoly 4340 Steel or 6AL4V Titanium, COBB Tuning Connecting Rods utilize an I-beam design, 12 point cap screw H-11 tool steel rod bolts, 52mm big end diameter and fine-finish ‘floating’ piston pin bushing as standard. All rods come machined within a tolerance of 0.001” and are full balanced and hardened — ready for installation. Currently two rod lengths are available, stock STI length and our own longer rod. While we prefer to use the longer rod in all of our own applications, we are happy to supply the shorter STI rod on request. Our reasons for using the longer rod are multi-fold and founded through our extensive motorsports programs as well as CAD-based and dyno-cell research and development. While not the opinion of all Subaru engine builders, we find NO BENEFICIAL REASON for using a shorter-than-stock connecting rod. Each of our Longer Chromoly 4340 Steel rods have a total weight of 544 grams each with a rotational weight of only 392 grams. All this while maintaining superior strength and durability! With the proper design and material selection, you don’t HAVE to be heavy to be strong. Furthermore, be wary of inexpensive rods you may find elsewhere — you get what you pay for. Rod failure nearly always destroys the entire block which is far more expensive to repair compared to simply spending slightly more money to do it right the first time! When using our longer rod with your engine build, please note you will need to alter your piston’s compression height to re-establish proper piston deck height. Feel free to contact us for technical assistance when ordering. Due to our desire to maintain a competitive advantage, we reserve the right to withhold critical dimensions for our longer rod until the order has been placed and confirmed.